The City of Toronto is studying a series of transportation projects, initiatives and polices to support the vision of the Highland Creek Village Area Study (2012) and re-development of the Highland Creek Village area. The mobility needs of local residents, employees, businesses and all road users will be considered. The Highland Creek Village Transportation Master Plan remains in draft form and is actively being reviewed by staff. Many of the recommendations made in the Transportation Master Plan are contingent on future development activity and applications currently in review by City Planning. This provides some challenges for the study in terms of finalizing an implementation schedule. Additionally finalizing the study depends on the availability of funding from City Council, property acquisitions, receiving the necessary planning approvals/permits, and completion of the designs. While staff work on these challenges, the Councillor will be engaged before proceeding further. In 2012, the City of Toronto completed the Highland Creek Village Area Study to guide growth and development activities in the area. Through significant community consultation with residents and businesses, the Area Study developed a vision for Highland Creek Village which included changes to the transportation network and pedestrian realm. This Transportation Master Plan (TMP) study will identify and evaluate a series of transportation solutions to address problems and opportunities in the area, including the transportation changes recommended in the Area Study. Potential solutions include new road connections, streetscaping, pedestrian and cycling infrastructure, on-street parking and transportation policies (i.e. Official Plan Amendments). The mobility needs of local residents, employees, businesses and all road users (pedestrians, cyclists, transit users, and motorists) will be considered. Once complete, the TMP will recommend a series of transportation projects, initiatives and policies which support re-development of Highland Creek Village as a vibrant, mixed-use, community-focused and pedestrian-friendly destination. A small and diverse group of stakeholders participated in a walking tour to document existing transporation problems and future opportunities. Potential improvements to the roadway network, pedestrian environment, streetscaping, cycling connections, on-street parking and transit were also part of this walking conversation. The first of two public events for this study took place on Wednesday, June 25, 2014 at the Royal Canadian Legion to discuss transportation issues and ideas for improvements in the area. Staff met with Village businesses to discuss existing parking conditions, staff recommendation to remove angled parking in long-term, and alternative parking solutions to supplement parking needs. Staff met with stakeholders from last year’s WalkShop and Parking meetings to discuss the preliminary recommended solution and information materials for the June 24 public meeting. The second public event took place on Wednesday, June 25, 2014 at the Royal Canadian Legion to discuss the preliminary recommended solution. A Transportation Master Plan provides a framework for how the City will address its current and future land use and transportation needs. At the second Public Information Centre (PIC) on June 24, 2015, the study’s evaluation process, preliminary recommended solutions and implementation scenarios were presented for public review and input. Once completed, this study will recommend a series of transportation projects, initiatives and policies to support re-development in the Highland Creek Village Area. These types of projects would be implemented over a 10 or 20 year period. A Class Environmental Assessment (commonly known as an Class EA) is a study required by the Ontario Ministry of Environment and Climate Change (MOECC) to assess the potential positive or negative effects of an individual project on the environment (i.e., social, cultural, natural, technical and economic environment). This Transportation Master Plan will identify changes to the transportation network and pedestrian realm which support new development and revitalization, and accommodation of all modes of transportation in Highland Creek Village. Infrastructure – continuous sidewalks, additional on-street parking, parking reconfiguration, bicycle facilities, new signalized intersections and new/re-configured roads. Network Analysis – forecasting traffic demands and enhance multimodal network of roads, transit, pedestrian, and cycling infrastructure to establish best infrastructure fit. Policy and Standards – Urban Design Guidelines, Toronto Bike Plan, Toronto Pedestrian Charter, 2012 Highland Creek Village Area Study, Accessibility Guidelines, Accessibility for Ontarians with Disabilities Act, 2005. Implementation Plan – costs, priorities, funding. When completed, the study will provide an Implementation Plan which sets out the costs, priorities, funding for all the recommended improvements. 4. Why is this study taking place now? The Highland Creek Village Area Study recommended a plan that allows for mixed use and higher residential density in the Village. Changes to the Village’s infrastructure (i.e. roads, sidewalks and water service) are required to support the future development. 5. Who initiated this study? Any modifications to the road network should enhance the pedestrian realm, allow for more on-street parking opportunities and improve safety and traffic flow in and around the Village. 6. What are the boundaries of the study area? 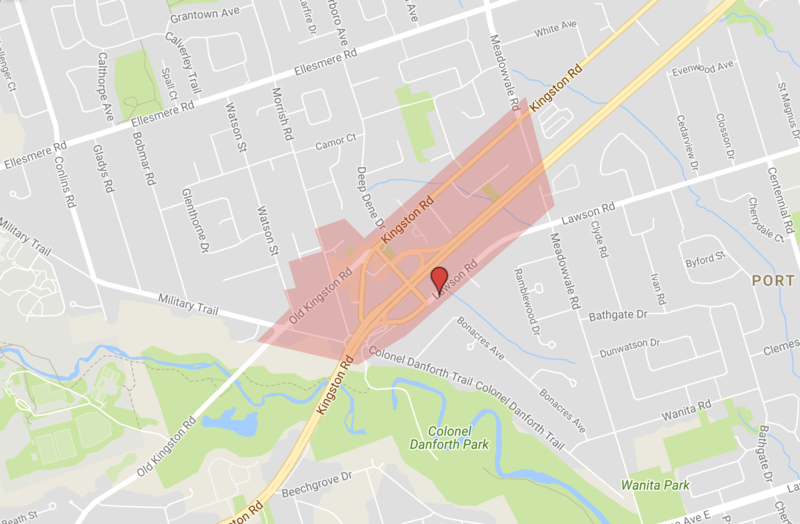 The study area is generally bounded on the south and north by Highway 2A and Kingston Road / Old Kingston Road, and between Military Trail in the west and Meadowvale Road in the east. 7. What parking option is being proposed for Old Kingston Road? The replacement of the non-standard angled and perpendicular parking with parallel parking on Old Kingston Road (east of Morrish Road) and Morrish Road (north of Old Kingston Road) has been proposed in order to widen sidewalks / boulevard areas and improve the pedestrian environment in the Village (e.g. accessible sidewalks, street trees and plantings, decorative lighting, and new street furniture). These improvements will help to make the area more pedestrian friendly, accessible and safer for all ages. Based on comments received from Morrish Plaza businesses, there was a concerted effort to provide more areas for on-street parallel parking along Old Kingston Road as well as along the proposed Morrish Road and Kingston Road “loop”, and on Military Trail. Furthermore, on-street parking areas will be complimented by the onsite parking that would be provided on future re-developed sites. As development takes place, the commercial elements will be required to provide parking to support the retail uses. This will supplement any angled / perpendicular parking that may be lost as a result of the reconfiguration to parallel parking. 8. Is there a minimum number of parking spaces required for each business? The minimum number of required on-site (i.e., private) parking spaces is allocated based on land use type (e.g., gross floor area of retail or office use). The City of Toronto Zoning By-law 569-2013, as amended (Office Consolidation), Chapter 200 Parking Space Regulations, identifies how to calculate the number of on-site parking spaces that are to be provided collectively for each use on a lot. There are no City bylaws that identify requirements for a minimum number of on-street (i.e., public) parking spaces to be provided for each business. 9. What is proposed for the Lawson Overpass? The overpass was reconstructed in 2000 and its service life is expected to continue for at least another 20 years (as of 2015). It is not the intent of the City to revisit the need for this structure over the short term, but rather to plan for its potential removal in the long-term. 10. What is the benefit of the proposed changes for Pedestrians? Creating an area which is safe, attractive, and accessible for all residents is a focus of this Transportation Master Plan. This is accomplished by improving and widening sidewalks, providing additional sidewalks, implementing streetscape improvements (e.g. street trees, decorative lighting, new street furniture etc. ), re-aligning roads, and providing additional safe crossing alternatives (e.g. across Highway 2A). As a result, Highland Creek Village will become a more pedestrian friendly destination. The conversion of Highway 2A into an arterial road with traffic signals will also reduce traffic speeds and further improve the safety and attractiveness of the Village’s pedestrian environment. 11. Why are changes to the transportation network in the Village required to support future development? Development and growth within the Village will have to be accommodated by the Village’s transportation network, including roads, sidewalks, and bicycle routes. Additional and improved connections to the surrounding transportation network also need to be considered. Moreover, there is a significant opportunity to provide improved opportunities for redevelopment by freeing up surplus highway and ramp areas that are located in the vicinity of Highway 2A. This study has considered planned growth in the Village area to determine improvements that will support the long term mobility needs of existing and future residents, businesses, and employees. The plan will adopt a multi-modal approach which will support all roadway users, improve connections, broaden transportation options, and serve to encourage the increased use of transit, cycling, and walking as viable modes of transportation. 12. What improvements can residents and businesses expect to see as a result of implementing the TMP? The projects recommended by the TMP will support the long-term revitalization of Highland Creek Village into a vibrant, pedestrian-friendly, and mixed use community. Proposed investments in the public realm, streetscape, and pedestrian environment have the potential to make the area more attractive to both existing and future residents, employees, visitors, and customers. New bike lanes will also support and encourage cycling in the Village. Moreover, the TMP will provide all roadway users, including vehicles, pedestrians, and cyclists, with improved access/connections to and from the Village, providing increased connectivity to the rest of the City’s transportation network. The Village’s existing network of ramps and one-way accesses is confusing and can dissuade visitors and customers from stopping in the Village. Proposed new signalized intersections along Highway 2A represent an opportunity to make access to the Village’s centre more direct and convenient for vehicles, cyclists, and pedestrians. 13. What will happen to through Traffic? Vehicle traffic in and around the Village area was studied in order to understand how through traffic may be impacted by proposed changes to the transportation network. It is understood that there is a range of different desires when it comes to through traffic in the Village: a reduction in through traffic is seen by some as a loss of pass-by business, whereas others view reduced through traffic as a means to reduce morning commute times and improve the safety and attractiveness of the Village’s pedestrian environment. The study team has worked with the community to balance these concerns and develop a solution that best meets the Village’s current and future needs. Old Kingston Road will remain open and is expected to continue to serve as an important connection for the local community. As a result, it is expected that local business will continue to benefit from local pass by vehicle traffic along Old Kingston Road. 14. How long will the study take to complete? The Transportation Master Plan (report) is expected to be completed late 2015, with a staff report to City Council in early 2016. 15. What happens when this study is complete? A staff report on the study recommendations must be presented to a committee of City Council called the Public Works & Infrastructure Committee (PW&IC). The PW&IC reviews the staff report and can adopt the staff recommendations or suggest revisions. The outcome of the PW&IC review to adopt or revise the study recommendations is then passed on to City Council for use in their decision making process. Interested members of the public can arrange to speak with or submit comments to the PW&IC. How to have your say on this study. We anticipate that this study will be completed and a staff report presented to PWIC early in 2016. Once we confirm this timing, we will inform the project mailing list of the staff report recommendations and the date of the PWIC meeting. If City Council adopts the staff report recommendations, a Notice of Study Completion is issued to all stakeholders and the project mailing list and a copy of the Transportation Master Plan document is made available on our website and in select local libraries for a 30-day review period. During the 30-day review period, a person can contact the City to resolve any outstanding concerns regarding the project. Please refer to Question 16 for details on the 30-day review period process. Note: some of the projects which may get recommended in the TMP with a higher cost and environmental impact, like the removal of the Highland Creek Overpass, will require further study and completion of Phases 3 and 4 of the Municipal Class EA process at a later date. A good reference for the different classification of projects within this Environmental Assessment process is available on the project webpage. Visit the Projects and Implementation Scenario Panel (No.19) from Public Meeting #2 Information Materials. 16. Who do I contact if I have comments or concerns during the 30 calendar day public review process? If concerns related to the Schedule B projects identified through this study cannot be resolved in discussion with the City of Toronto, a person or party may request that the Minister of Environment and Climate Change (MOECC) make an order for the project to comply with Part II of the Environmental Assessment Act (referred to as a Part II Order). A Part II Order is an appeal provision for elevating the status of a Schedule B project to a Schedule C Environmental Assessment (EA) process. Note: Requests for an order to comply with Part II of the EA Act, are possible only for the specific projects identified as a Schedule B within the Transportation Master Plan, and not the Transportation Master Plan itself. The City of Toronto will remain available to meet with interested parties and agencies to review the details of the proposed projects within the TMP. Any party wishing to provide additional comments on or requiring additional information regarding the projects is encouraged to contact the City of Toronto at the address above. 17. What is the implementation schedule for individual projects which are recommended in the study? The study will identify both large and small scale transportation related projects as well as long-term water-related servicing needs (water, wastewater, and stormwater). Many of these projects could be wholly or partially funded through Section 37 benefits, which come out of the development review process. These benefits can be achieved when more height and/or density than is otherwise permitted in the Zoning By-law is approved, in return for the provision of community benefits. Streetscape improvements not abutting a site is one such project. New development would also be required to provide localised improvements adjacent to their site as per the approved TMP, as well as the Urban Design Guidelines. City Council directive to fund TMP approved projects. Streetscape and public realm related improvements could be advanced through City of Toronto Public Realm Initiatives (e.g., Beautiful Streets). 18. Where is the funding for the plan coming from? Currently, the City’s 10-Year Capital Works Budget does not allocate funding towards road improvements for this project. Future funding to implement the study’s findings will require City Council approval. Through Section 37 of the Planning Act, there may be opportunities to secure funds for community benefits such as improving the area’s streetscape for lands other than those abutting a subject property. 19. Will property acquisition be necessary? Some property acquisition will be necessary. This study will perform an initial assessment of where property may be required to achieve the required public right-of-way in order to allow for the approved plan to be implemented. Detailed property requirements will be confirmed during detailed design activities that will follow this study. Most, if not all, property acquisition will be realized through the development approval process and will occur over an extended period of time (10-20+ years). The City will consult with affected property owners and negotiate property acquisition prior to construction. 20. Is student housing for University of Toronto Scarborough campus being addressed as part of this study? Student housing is not being examined as part of this transportation study. The Highland Creek Village Area Study (2012) and associated amendments to the Official Plan and Zoning By-Law establishes development of lands and type of land uses that are encouraged and allowed in the study area. The majority of the TMP study area is zoned as, Commercial-Residential (CR) which permits residential dwellings, including student housing, commercial, retail uses and prohibits automotive related uses. The CR zone also does not permit detached, semi-detached or split-level dwellings. The University of Toronto has completed a Scarborough Campus Master Plan (2011) which includes on-site student housing. However, this Master Plan remains conceptual in nature and a land use study will need to be completed in partnership with the City of Toronto, consultation with the public, feedback from community agencies prior to finalizing the study including a student housing component. 21. What can I do to get involved? As part of this study, the City has hosted three (3) stakeholder meetings, two (2) larger public events, called Public Information Centre (PIC) meetings, and one (1) informal “pop-up” consultation in partnership with City Planning, “Planners in Public Spaces” initiative. The public events included a drop-in portion for viewing study materials and speaking one-on-one with members of the project team, a presentation followed by a question-and-answer session. The first public event also included breakout group sessions and an opportunity to rate ideas proposed by the project team and/or other event attendees. 22. What efforts are being made to work with businesses and residents in designing a plan? Efforts to work with businesses, residents and key stakeholders in the area throughout the study process and have included three stakeholder workshops. 23. Who else are you consulting with? 24. Why are walking and cycling in Highland Creek Village important? Section 2.4, Policy 7-a: Policies, programs and infrastructure will be introduced to create a safe, comfortable and bicycle friendly environment that encourages people of all ages to cycle for everyday transportation and enjoyment including an expanded bikeway network. Section 2.4, Policy 8: An urban environment and infrastructure will be created that encourages and supports walking throughout the city through policies and practices that ensure safe, direct, comfortable, attractive, and convenient pedestrian conditions, including safe walking routes to schools, recreation areas, and transit. Section 2.4, Policy 9-e: The transportation system will be developed to be inclusive of the needs of people with disabilities and seniors by taking accessibility into account from the design stage onwards. For Highland Creek Village, this means planning for sidewalks where they do not currently exist, improving existing sidewalks and connecting pedestrian facilities so that the entire village is walkable. Cycling improvements are necessary to connect the Village to the larger surrounding cycling network, as well provide safe cycling opportunities through the Village. 25. How will the natural green space be impacted? A review of the natural heritage features in the study area was carried out in consultation with the Ministry of Natural Resources and Forestry (MNRF) and the Toronto Region Conservation Authority (TRCA). Based on the information provided by the MNRF and TRCA , the study area is predominantly developed and there are no Areas of Natural or Scientific Interest, Significant Woodlands, wetlands and/or Species At Risk present. The ultimate vision for the Highland Creek Village includes an enhanced streetscape design that includes additional street trees and well landscaped open spaces. 26. How will the unique character of the Village be maintained? The 2012 Highland Creek Village Area Study presented a long term land use planning vision that supports opportunities for redevelopment and reinvestment in the Village while respecting the area’s heritage and character. The Urban Design Guidelines that were developed together with the Area Study included co-ordinated streetscape improvements that reflect the Village’s history (e.g. signage, street trees, street furniture, and lighting), public art direction and locations, and recommended building exterior materials that reflect the Village’s built heritage. Both documents were produced in consultation with area residents and businesses. 27. What is the Accessibility for Ontarians with Disabilities Act (AODA)? The Accessibility for Ontarians with Disabilities Act (AODA) was enacted by the provincial government in 2005 to help make Ontario accessible to people with disabilities. This act lays the framework for the development of province-wide mandatory standards on accessibility in all areas of daily life. 28. Will Accessibility for Ontarians with Disabilities Act apply to this Transportation Master Plan? Conceptual and functional designs for new or upgraded infrastructure (e.g. sidewalks) that are developed as part of this project will be AODA compliant (where applicable). In the future more detailed designed stages occurring subsequent to this study, all new or upgraded infrastructure components (e.g. pedestrian signals / push buttons, signage, etc.) that will be implemented by the City of Toronto must comply with AODA standards.